I’m aware of the triumph and the defeat, the ups and downs, the trials and tribulations and the non-stop cycle of sad/happy/sad/happy emotions. I’m made aware of these feelings by the sight of the emerald and violet glow from the lights affixed to the front doorways of houses lining the quiet neighborhood streets of the South Side’s Mount Greenwood and Beverly neighborhoods. I’m aware, like all of those who dwell within those neighborhoods, of what’s at stake and for whom it is that we share a common awareness of : her name is Emily Beazley and she’s only 12-years-old. She also happens to be suffering tremendously from the toll four years of battling cancer has taken on her body. But through it all, the young girl’s heart remains intact and stronger and braver than any. Emily is eldest daughter to Ed and Nadia Beazley and big sister to eight-year-old Olivia. In the spring of 2011, at the tender age of just eight, she was diagnosed with Stage III T-Cell Lymphoblastic Non-Hodgkins Lymphoma. Her mother told me that the family was obviously devastated by this diagnosis, but didn’t waste any time in trying to save Emily’s life by any means necessary. Her father, a Chicago police detective, has undoubtably come across some tough guys in his career. However, it’s doubtful any have the toughness of his daughter Emily. She and her family have gone through what only can be described as a labyrinthine journey through medicine and treatment to combat this disease the last four years. Every possible drug and every possible cure has been administered. And for a time it appeared to be taking hold as Emily’s cancer went in to remission. Unfortunately, recently the cancer didn’t quite take the hint that it was no longer welcome and has returned. It has been a seriously hard fought brawl with this menacing illness. But now, after a four-year battle, Emily’s mother Nadia concedes every single avenue has been exhausted in the fight for her daughter’s life. Yet despite the fact that science has failed her, this four -foot-nothing giant continues to bravely stand in there and fight like hell. She has continued to lace up the boxing gloves and answered the bell for yet another round, swinging hard like Manny Pacquiao. She’s still undergoing radiation treatment because the boxing gloves are still on. But the toll of the battle is hard. Emily is now living with the use of one lung, depriving her of sleep most nights. Other parts of her body have also turned against her, causing her much pain and suffering. She’s begun to receive palliative care to provide relief from the pain and stress of cancer. She’s fully aware, her mother said, of the seriousness of her condition. But Emily is too strong and stubborn to quit. She assures her mom that it’s going to be ok. This is a girl with the heart of a fighter. Recently a friend of the Beazley family started a simple but effective campaign of awareness for Emily called “Light It Up for Emily.” By replacing a porch light with a green or purple light the homeowners show their support for Emily’s cause. Green signifies awareness for childhood cancer and purple just happens to be Emily’s favorite color. I couldn’t help but notice the emerald glow emanating from so many houses and it’s spreading. Every night for the past three weeks I’ve seen the number of lights increase dramatically, and not only in Chicago. Nadia has received photos from residences as far away as California and New Jersey lit up in green and purple. Here in Chicago, the support that started on the far South Side made its way to the Loop, with the Blue Cross/Blue Shield Tower at at north end of Millennium Park and the Willis Tower both recently being awash in purple and green. It’s a beautiful sight to behold indeed. Emily has been out with her mom driving around checking out the lights and she thinks it’s pretty cool. In fact she loves it. Nadia has expressed her amazement at the outpouring of support for her daughter and family. From the beginning, the Beazley’s have been very open about the struggle. Not just for Emily and her personal battle, but to raise awareness and gain support for childhood cancer research. Their candidness has resulted in a rallying effect from the Mount Greenwood neighborhood and beyond. 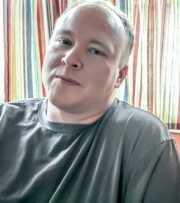 A fundraiser was held in 2012 to raise money for the family’s medical costs. Neighbors frequently cook meals and deliver them to the house. 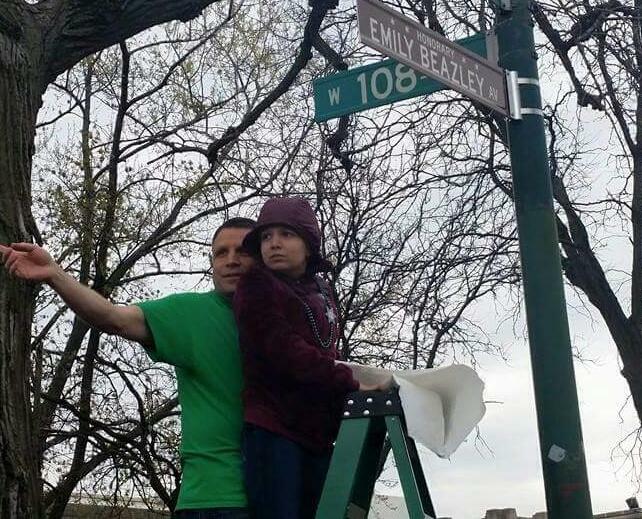 On April 24, a section of the 10800 block of South Homan Avenue was renamed in honor of Emily. More than 1,000 people came out including students from neighborhood schools, all to see Emily unveil the honorary street sign named for her. On that cool day, Emily struggled to climb the ladder to get close to the street sign, which was wrapped in paper. She struggled again to pull the string that was attached to the paper so that the sign could be unveiled, but with an assist from her father, she did it. The crowd cheered, Emily smiled and took in the outpouring of love and support from friends and strangers alike that never ceases to astound her family. This is all spontaneous assistance that was borne out of generosity, respect and love for a young girl whose towering bravery and will to live are nothing short of astounding. 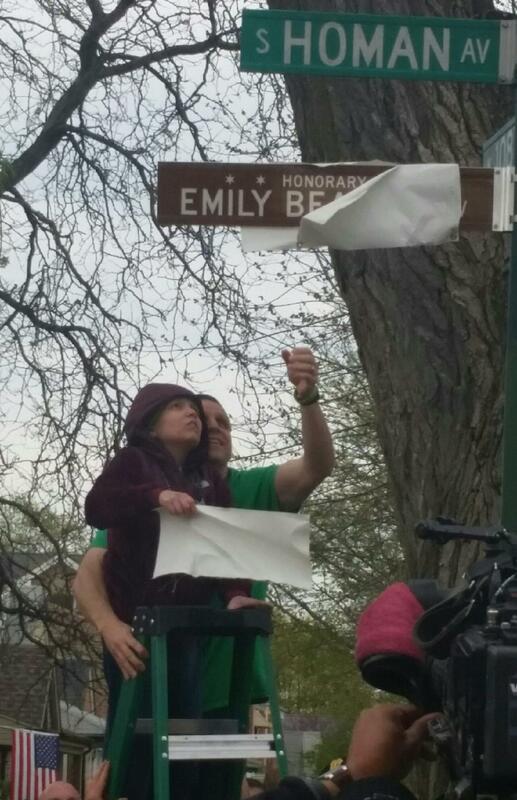 Emily Beazley and her father Ed unveil an honorary street sign for her April 24. Each and every green and purple light signifies people who aren’t only aware of the disease itself, but of Emily Beazley and what she represents. It made me realize we are fulfilling a dying girl’s final wishes to continue the fight on her behalf so that no other kid will have to fight like she does. If we really sit and reflect on it, it stops us cold in our tracks and melts our hearts. It makes us realize that even the most hardened narcissists can be brought to their knees by the moving courage and will to live this girl possesses. It’s inspiring, it really, truly is. The Beazley’s have made a commitment not to mourn their daughter while she’s alive and they won’t cry unless she cries. I wish I could say the same for myself while writing this piece. The effect of the Emily Beazley experience hasn’t just been limited to awareness, but of forgetfulness as well. Her story has the ability to make us forget about the daily cynicism we grow accustomed to. It makes us forget about whatever insignificant, petty nonsense the day delivers to our doorsteps. It makes us forget about whatever problems we consider too great to conquer. She makes us forget about ourselves for a little while and think about her and it stirs up feelings of love and good will. Her mother expresses the deepest gratitude and love to the Mount Greenwood community and reminds is that Emily is still fighting. But it is us who should be thanking her daughter for showing us a heart of a champion, for showing us what it really means to be human and for showing us how to live and love fearlessly. Ed and Emily Beazley admire the Mount Greenwood crowd of supporters. Wonderful. Written with such compassion and clarity. Thank you for honoring Emily and spreading awareness for childhood cancer! I love this family so much ! Emily is a gift to the world and I hope that all who have been affected by her don’t forget her or her mission. Make a donation to pediatric cancer research. Talk to your local politicians about changing the protocol on funding for pediatric cancer. If Emily has made you feel any sort of love, compassion or made you just think for a moment about how blessed you are ….. Do something !! !